Graspan, an action also referred to as the Battle of Enslin, was fought on 25 November 1899 (during the Second South African War) by a British force of 8,500 men under Lieut.-General Lord Methuen while attempting to break the Boer siege of Kimberley. Items about the Battle of Graspan. Graspan, an action also referred to as the Battle of Enslin, was fought on 25 November 1899 (during the Second South African War) by a British force of 8,500 men under Lieut.-General Lord Methuen while attempting to break the Boer siege of Kimberley. After an earlier engagement at Belmont (q.v. ), eighteen kilometres to the south along the single-track railway line which formed the axis of the British advance, Methuen found the Boers occupying a line of kopjes (small hills) about 60 metres high to the east of the railway station at Graspan. Information from British reconnaissance parties indicated that only about 400 enemy were present, supported by two guns. To prevent the enemy escaping as had happened at Belmont, Methuen decided to engage the Boer position first with artillery fire while working the 900 mounted troops available to him around both flanks. Once these were in position, a frontal assault was to be mounted by the small Naval Brigade operating with his force. 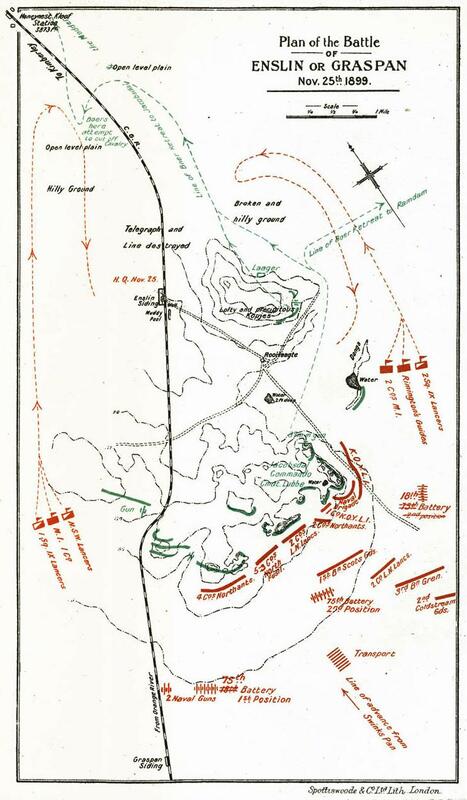 Unfortunately for this plan of attack, unknown to Methuen - whose scouts were unable to observe into the enemy position from closer than about two kilometres - the original Boer defenders were reinforced late on the afternoon of 24 November by 2,000 Free State burghers under Commandant Jacobus Prinsloo. When the British field batteries opened up soon after 6 a.m. the next morning, the answering fire from the Boers came from five guns instead of two - not including a Hotchkiss quick-fire weapon and a Maxim machine-gun. Realising that his original scheme was unworkable, Methuen promptly opted for an all-out attack on conventional lines. This effort would pit the Naval Brigade with some infantry detachments against the Boers eastern (left) flank, while the rest of the British force sought to immobilise the enemy elsewhere and prevent reinforcement of the sector under attack. This plan worked, but not before the 245 strong assault force had lost 15 killed and 79 wounded. By the time the crest of the hill was reached, the enemy had all gone except for a small group which resisted until only one man remained alive. The British could observe the Boris retiring in good order across the plain back into Free State territory, but a shortage of mounted troops meant that a vigorous pursuit was not possible. The British weakness in this regard was graphically demonstrated at one point during the Boer retreat, when a large body of burghers suddenly turned and attempted to ride down the lesser number of British horsemen from the 9th Lancers trying to follow them. The threat was averted by the response of some Mounted infantry who, along with a detachment of 29 members of the New South Wales Lancers under Lieut. S.F. Osborne, occupied a fold in the ground and poured a heavy fire into the advancing Boers. The incident reportedly won for Osborne and his men the nickname of ‘The Fighting Twenty-Nine.'. The engagement had demonstrated once again that the Boers were more than a match for Methuen despite his numerical superiority. While he responded by complaining about the deficiency in the number of mounted troops available to him, and confirmed his disappointment in the part played by his cavalry by removing the commander of the 9th Lancers, nothing could disguise his own tactical incompetence which saw his force suffer total casualties at Graspan of seventeen dead and 168 wounded. 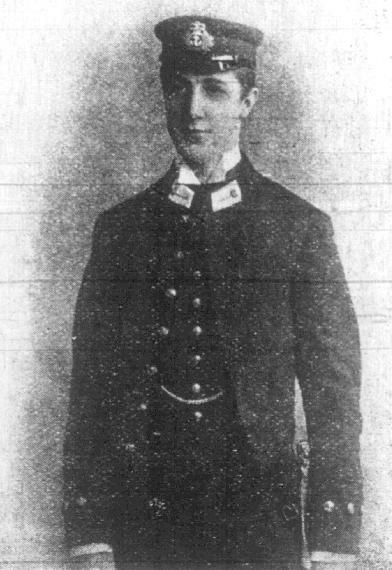 Among the dead of the Naval Brigade was 19-year-old Midshipman C. I. Huddart of Ballarat, Victoria. Extracted from the book produced by Chris Coulthard-Clark, Where Australians Fought - The Encyclopaedia of Australia's Battles, Allen and Unwin, Sydney, 1998, pp. 58-59. W. Baring Pemberton (1964) Battles of the Boer War, London. L.M. Field (1979) The forgotten War, Carlton, Vic. Melbourne University Press. The British arms have achieved a brilliant victory. An armoured train sent out to reconnoitre encountered the Boars at Graspan. A patrol under Lieutenant Lewis was fired on, and Lieutenant Lewis and a private were killed. The division bivouacked for the night at Swinkspan. 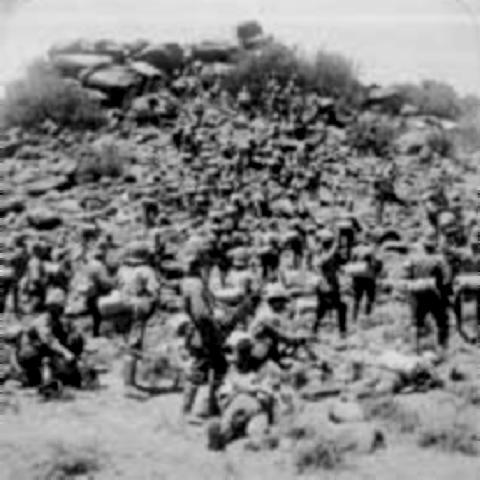 At daybreak they stormed the kopjes at Enslin occupied by the enemy. Two batteries of artillery posted on each side shelled the enemy and made splendid practice. The Doers stuck tenaciously to their positions. The Naval Brigade, however, with the Yorkshire Light Infantry, Northamptons, Northumberlands, and Loyal North Lancashires, stormed the enemy's positions. A withering fire was sent into them, but kopje after kopje was captured. The Boers made good their retreat. The 9th Lancers attempted to intercept the movement and succeeded in reaching the enemy, but a severe fire was opened upon them from a kopje, and they were forced to retreat. Remington's Scouts also faced a terribly severe fire when charging the enemy. The infantry worked magnificently, taking the enemy's positions at the point of the bayonet. The Naval Brigade suffered severely in storming the last position. Commander Ethelston was killed, and Captain Prothero was wounded. Nine others were killed. The Boers were shelled during the final retreat, end must have lost heavily. Commandant Cronje was with the Boers. Thirty of the enemy's wounded. have been brought here. Our casualties were not so severe as at Belmont. The wounded were taken away by the hospital train. Among the Boer prisoners are Alderman Jeppo and Commandant Rissik, who led a commando. The enemy's strength is estimated to have been 3,000. They retired in a northerly direction. The official details of the defence of Kuruman show that the mission station, which was formerly the centre of Dr. Moffat'e long work among the natives of that part of Africa, was the point of resistance to the Boer attack. When the Boer commandant notified the magistrate of his intention to occupy the place, the latter replied that he had orders to defend it, and forthwith collected 20 natives and 30 half-castes, with whose aid he barricaded the mission chapel and there resisted the attack of 500 Boers for sin days and nights, after which the Boers abandoned the attack. 6371 L.-Cpl. F. Lewis Ply. A telegram from the General Commanding in South Africa has been received at the War Office giving the following list of killed, wounded, and missing as far as they can at present be ascertained. 1ST BATTALION YORKSHIRE LIGHT INFANTRY. Sergeant Farrier G. A. King. 1ST BATTALION LOYAL NORTH LANCASHIRE REGIMENT. 5506 Pte. J. E. Gender. Killed: Lieutenant F. Owen Lewis, 14th Bombay Infantry. 5095 Private J. Coles, 1st Loyal North Lancashire. 5817 Lance-Corporal J. Hall, 1st Loyal North Lancashire. Lieutenant J. G. Stirling, 9th Lancers. 4300 Private F. Young, 9th Lancers. Montague (Macgregor) Grover was born 31 May 1870 in West Melbourne, Victoria. He was the son of Harry Ehret Grover. As a journalist, first with David Syme and then the Argus in 1896. For ten years remained one of the paper's chief police reporters and political roundsmen. Grover was an experienced writer and wrote many poems and had them published thoughout Victoria. The following poem, I Killed a Man at Graspan was published in the "The Coo-ee Reciter" in 1904 was very much in the anti-war genre that grew over the twentieth century. The poem is quite haunting and as such is popular throughout the bush poetry circles. Swear blind I acted right. From a thousand yards or more. An' we went at it then and there. He was the life that sped. Was spread on the boulders dead. An' there they're star'n still. Because of the thing I did. That was the poorest skite. To never ha' fired that shot. An' his blood still tricklin' out. The man that I killed is there. The look that his dead eyes cast. To fire on a man again. Apart from his poetry, one ongoing memorial remains for the work of Grover, the Montague Grover Award for cadet journalists aimed at promoting excellence in journalism. Grover died 7 March 1943 at "Casa del Rio", 95 Alexander Avenue, South Yarra, Victoria, Australia. Grover, Montague, The time is now ripe: revolution without tears, Robertson & Mullens, Melbourne, 1937.